None can disagree about the enchanting charm of hill station Kodaikanal and historical Mysore city. Both offer a unique travel experience, ensuring a memorable holiday to everyone. A trip encompassing both the places is something every traveller would love to embark on. Hence, we at mysoretoursim.travel which is part of Holidays DNA, have brought a wide range of tour packages clubbing tours to Mysore and Kodaikanal. Our travel experts have designed special Mysore Kodaikanal tour packages which offer umpteen choices to our customers for experience the royal touch of Mysore and natural bliss of Kodaikanal. From booking travel tickets to your choice of accommodation varying from budget hotels to luxury stay, from arranging guide to 24 hours cab service for sightseeing, from special arrangements for babies and older travellers to personal assistance throughout the trip, we take care of almost every travel necessity in our Mysore Kodaikanal tour packages. Our customers can book tour packages from any city they want as we offer tours from not all the prominent cities such as Chennai, Bangalore, Hyderabad, Pune, etc. to Mysore and Kodaikanal. We also offer tour packages from Mysore to Kodaikanal. Travellers can choose from a wide variety of tour packages as per their travel needs such as honeymoon packages, family packages, group tour or last minute travel package. No matter which packages you choose, Mysore and Kodaikanal is sure to make your travel memorable with their exceptional charm. Kodai Lake- One of the most popular sightseeing place in Kodaikanal, Kodai Lake is a man-made lake which is spread over an area of 60 acres. It was built Sir Vere Henry Levinge in 1938. Boating and pony rides are very popular here. Berijam Lake- Another prominent lake here is the Berijam Lake which is about 21 km away from Kodaikanal. An awesome picnic spot, this lake attracts tourist with its serene beauty. It is about 3 km long. Coakers Walk- One km long pathway which has been built on the slopes of a hillock, Coakers Walk is an enchanting place offers the most spectacular view of the hills around. It is also known for a unique phenomenon called ‘Broken Spectre’, according to which your shadow is cast on the clouds which cover the entire area. Bear Shola Falls- Kodaikanal Boasts of some of the best waterfalls in the country. Bear Shola falls, where bears are said to come to drink water, allures visitors with its breathtaking beauty. Another waterfall to visit here is Silver Cascade fall which falls from a height of 180 feet. Thalaiyar Falls and Pambar Falls are other waterfalls to visit in kodaikanal. Green Valley View- Offering a captivating view of the valley, Green Valley View is an ideal place for photographers. Best time to visit here is between 10 am to 3 pm. Mysore Palace- Residing place of Mysore Royal family, Mysore Palace is the most popular sightseeing place in Mysore. It is one of the largest palaces of India, which has been built combining various architectural styles by a British Architect Henry Irwin. Its structural grandness is sure to allure you. Mysore Zoo- It is considered to be one of the largest and oldest zoos in India. It is known for its extensive range of avian fauna. Birds from more than 40 countries are said to visit this place during migratory season. Its rich fauna and flora is worth seeing. Chamundeshwari Temple- Located on the Chamundi Hills, this temple is about 13 km from Mysore. Dedicated to Goddess Chamundi, it is one of the important religious shrine. The view of the city from the top of the hill is also makes this place worth visiting. Brindavan Gardens- Brindavan Gardens are terrace gardens which have were built by Sir Mirza Ismail, the then diwan of Mysore state. These gardens have alluring landscapes, parks with wide range of flowering plants. 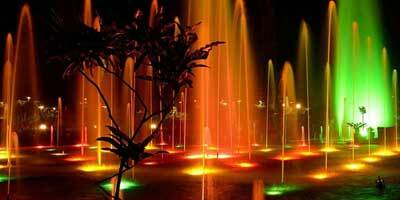 Fountains which are illuminated in evenings makes add to the beauty of these gardens. There is also facility of boating here. St. Philomena’s Church- One of the largest churches in India, St. Philomena's Church gained its present structure in 1933, during Maharaja Krishnaraja Wodeyar IV rule for the Europeans residents of Mysore, reflecting the religious harmony during that period. This church is dedicated to Saint Philomena. The distance between Mysore and Kodaikanal is about 345 km which can be covered in around 7 hours, while from Bangalore to Kodaikanal is about 463 km and away and is covered within 8 hours. There are many private as well as Government buses that run to the hill station Mysore and Bangalore. It is also connected via railways to Mysore and Bangalore. One can also hire a cab if interested. The nearest city to Kodaikanal is Madurai, which is another popular tourist destination. While the distance between Mysore and Bangalore is only 147 km which can be covered in about 3 hours of time.